It is a requirement of your Agreement, that the goods are protected against Theft and Accidental Damage. We can arrange Theft & Accidental Damage Cover for £1.32 per week. It is a requirement that products purchased on a credit agreement are insured. We can offer Theft and Accidental Damage Cover for £1.32 per week. 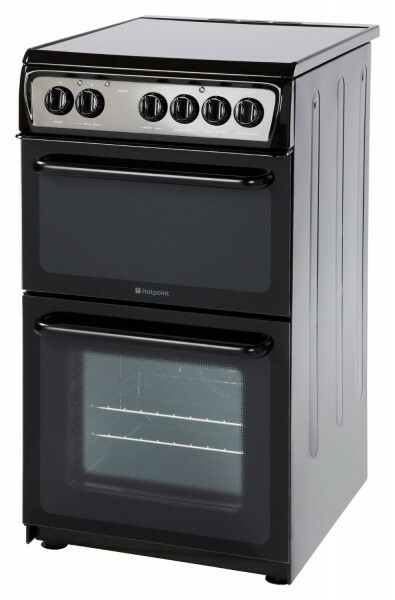 The Hotpoint HAE51KS Ceramic Twin Cavity Cooker comes in a stylish and sleek black finish measuring 50cm wide which is smaller than other standard cookers. This is great if you have limited space in your kitchen. Both sections of the cooker have lights, double glazed doors and are self-cleaning. The top section of this oven has both a grill and shelf whist the second section which, is the main section has an assisted fan and 2 shelves. The hob is ceramic with 4 heating zones featuring residual heating indicators.